Thank you @Carolyn_aka_Shal for this encouragement. You are so welcome. We all need encouragement. This is so true! I have a lot of family and friends who are having health problems now and not all are old! Cherish then no matter what the age! It really is a great message. God bless you mightily, and thank you for inviting me to this wonderful site. I held my moms hand for the first time since I was a kid and didn't want to let go, we all prayed together and all of us have grown closer this past year. The devil tries go break up families, but hell will not prevail against Gods kingdom. I will certainly keep you in prayer. I do know how things like this are. I myself have gone through many serious health issues over about the past four years, and family members passing away prior to that. My sister and I are very grateful for a family that has adopted us into their family, and we are very close to them. They all now live in different places and we miss them greatly. 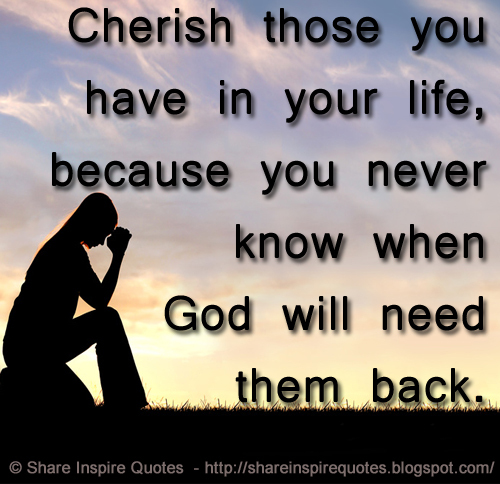 It's our prayer for them all to come back somewhere close to where we are. God is good, and we will stand together faith believing that He will answer our prayers. He's already been gracious and kept me alive when I should not be here, but for some reason He spared my life. So I know He's not finished. Just thought I would share this. Thank you for sharing your story.